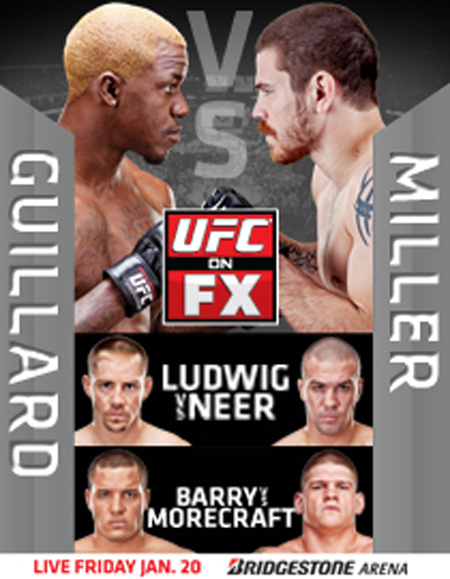 And then there were 10, as in ten bouts that will make up Friday’s “UFC on FX: Guillard vs. Miller” roster. With less than four days remaining until the curtain is drawn on their first major FX broadcast, the Ultimate Fighting Championship confirmed the last-minute addition of Tommy Hayden to the show. The lightweight agreed to replace injured Reza Madadi and make his big league debut against Fabricio Camoes. The 155-pound affair will be one of six preliminary bouts airing live on FUEL TV. FX broadcasts the main card live starting at 9PM ET/6PM PT. The event takes place inside Bridgestone Arena in Nashville, Tennessee. Lightweights Melvin Guillard and Jim Miller headline the festivities.